Glistening retro-style cans shuffle quickly down a conveyer belt, destined to be filled with cold, fizzy soda. Unlike most of their modern aluminum counterparts, these cans will contain a classic ingredient: real sugar. After decades of using corn syrup exclusively, PepsiCo returned to the sweet ingredient from Big Horn Basin beets in 2009 for speciality sodas. Initially introduced for a limited time only, Pepsi Throwback quickly caught on. It didn’t take long before consumer demand led to another limited-time production. By the spring of 2011, the sugar-infused Pepsi Throwback, along with Mountain Dew Throwback, became permanent. “It took off and we kept it,” said Dave Willard, vice president of production for Admiral Beverage, a bottling and distribution company based in Worland, Wyo. That’s good news for area farmers. With Throwback drinks, Admiral Beverage helped lead the way back to real sugar. It’s a departure from high fructose corn syrup, the sweetener commonly used in pop since the 1980s. Using Throwback concentrate from PepsiCo, Admiral Beverage combines it with Wyoming sugar and water, then carbonates it and puts it in cans or bottles. The company also produces Dr. Pepper Heritage with real sugar. Admiral Beverage used slightly more than 700,000 pounds of sugar from Big Horn Basin beets in 2012. With that granulated sugar, the company produced more than 250,000 cases of Throwback products last year. With 24 cans of pop to each case, that equates to more than 6 million cans. From Worland, Throwback products are distributed to seven states. The company’s plant in Ogden, Utah, also uses real sugar in Throwback products, that sugar coming from beets grown in Idaho. Today’s sugary soda draws on nostalgia, and that’s part of its success. For decades, Americans drank Pepsi and other colas sweetened with real sugar. Now, tasting the distinctive real sugar flavor reminds folks of what soda used to taste like — hence the Throwback name and retro logos. He said Mountain Dew drinkers notice the difference, too. The younger generation has started to make the switch from fructose to sugar. “They were raised on fructose, while people from my generation were raised on sugar,” Willard said. With a growing popularity of sugar-based drinks, more kids are going to know what sugar from beets tastes like. Admiral Beverage recently started bottling Hog Wash, a fruity drink that also uses real sugar. Created for kids, the juice comes in flavors like Piggleberry Punch, Gruntin’ Grape and Oinkin’ Orange. “Folks said we couldn’t make a fun, fruity drink without a pigpen full of calories — but that’s Hog Wash,” reads the company’s promotional description online. It’s billed as a low-calorie, vitamin-enriched juice drink. 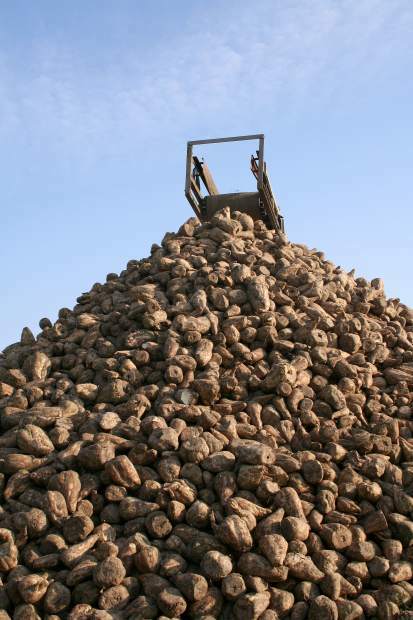 Produced by Wis-Pack, based in Wisconsin, Hog Wash now contains sugar from Wyoming beets. “We started producing that here in April, and we ship that to the West Coast,” Willard said. It’s possible more drinks containing sugar from Wyoming beet fields will someday appear on store shelves. “There are new drinks, new flavors on the horizon that we’ve been dealing with Pepsi Cola Bottling on,” Willard said. He said he can’t disclose any specific details of those products, but the possibilities for other drinks using real sugar are exciting, he said. “Anything to do with innovation in the sugar industry, we’re involved in,” he said. Sugar beet industry leaders recognized Admiral Beverages for its commitment to the natural sweetener. Kelly Clay, the president/CEO of Admiral Beverage, received a special “Friend of the Sugar Beet Industry” award from the American Sugarbeet Growers Association in 2011. “To be an advocate of sugar is part of our success with what we’ve done with Throwback,” he said. Willard said the company plans to continue supporting local communities and local agriculture. Tessa Schweigert is the features editor for the Powell, Wyo., Tribune.